Tweed Day – every day's a holiday! Today we sing the virtues of that most durable fabric, tweed. Tweed Day remembers the corrupt politician who held New York City in the palm of his hand in the mid-1800s. He was elected to the U.S. House of Representatives at the tender age of 29, to the New York State Senate in 1867, and in 1868 was made “grand sachem” (Big Poobah) of Tammany Hall. 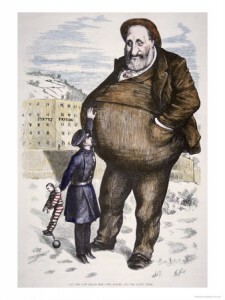 But in truth Tweed was still at the height of his power in late 1870 when an investigation by “six businessmen with unimpeachable reputations” found that Tweed’s books had been “faithfully kept” and could find no wrong-doing. Tweed was expected to run for and win the New York U.S. Senate seat in 1872. Tweed’s real downfall wasn’t the papers. It was a holiday: the Glorious Twelfth. No, not Grouse-hunting day, the other Glorious Twelfth. July 12th is a Northern Irish Protestant holiday celebrating King William of Orange’s victory over the largely Irish Catholic forces of King James II at the Battle of the Boyne in 1690. In July 1871, Irish Protestants in New York City (the Loyal Order of Orange) sought permission to throw an Orange Parade. The marchers the previous year had the ingenious idea of hurling epithets at Irish workers who were laying pipe along the streets they passed, and sang such rousing hits as “Croppies, Lie Down.” Eight people were killed in the violence that ensued. Tweed nixed the 1871 parade, and the Protestants, fearing that Irish Catholics had taken over their city, laid into Tweed. Public tide rapidly turned against him until Tweed and the Governor were forced to reverse the decision and allowed the parade to take place. In the infamous “Orange Riots of July 12th” that started as a parade, between thirty and sixty people were killed, including two police officers. Over a hundred citizens were wounded, and twenty policemen. After the riot, both sides were fed up with the Boss. And someone upset at Tweed for the whole parade debacle supplied the Times with the incriminating evidence they needed to convict him in the court of public approval. The investigation revealed a plague of graft and corruption unprecedented in American politics. 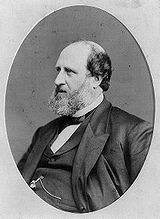 In one example, New York City paid more for a single courthouse under Tweed than Secretary of State Seward had just paid for the territory of Alaska. When news of New York City’s debt spread overseas, European officials cut off the city’s line of credit and removed NYC bonds from the Berlin Stock Exchange. 1875-1878: Tweed is immediately sued for 6 million by creditors. Unable to repay the debts, he’s re-incarcerated. He escapes to Cuba, but is returned by Spanish authorities. 1878: Boss Tweed, once the third largest property owner in New York City, dies in prison, a broken man. He is 55. Moral of the story: You can lie, cheat, and steal, but don’t mess with people’s parades. Or their holidays. I’ve no idea who started this holiday, or why we remember a corrupt politician. The earliest references I’ve found are only a few decades old, in Chase’s Calendar of Events. But for the record, everydaysaholiday.org neither condones nor condemns this holiday, and we wholly support the right of the God-loving people of this land to celebrate the durable Scottish fabric we call Tweed.